In the good old days you had to be a king to own a castle in Ireland. Today however there are many castles for sale in Ireland and you don’t have to be a king to by them. Having said this, restoring and maintaining a castle can be a tough job, so you do need to have the heart of lion and not to forget time and money in order to take care of your castle. Situated on the banks of River Brosna, Clonony Castle occupies a strategic spot at the entrance to the Shannon. The McCoughlan clan built this castle back in1500. This is one amongst a number of castles built by the same family around the area. The structure stands fifty feet above the ground and was inhabited by people up until a few years ago. The castle is set up on a rocky outcrop surrounded by a beautiful lawn. You will find the property to have quite a few of its defensive details in tact. The machicolations seems to be right in place. This was the area in the castle wall used to drop missiles on the enemies. A large limestone slab known as the Bullen Stone is situated under a hawthorn tree. Here lie buried the remains of Mary Bullen and Elizabeth. This castle is being sold at Euro 695,000. It is believed that this fourteenth century stronghold belonged to the descendants of William the Conqueror. The massive structure is actually erected on a small piece of land. A wall surrounds the castle which has a large oak door as its entrance along with a hallway and an overhead murder hole. A galley kitchen and a great hall are to be found on the ground floor. The first floor houses the master bedroom. The bed was taken apart to take upstairs where it has been reassembled. One of the window alcoves hosts a cast iron bath and the turret has a walk in shower. The second floor has two double bedrooms. This wondrous castle structure is being sold at Euro 800,000. This sixteenth century castle spreads over the fields of Athenry. The restoration of the castle began back in 1960 and has almost been done over. The castle has running water and toilets along with basic kitchen facilities. The hallway has a 22 feet high ceiling. This is a rather simple yet very impressive castle being sold for Euro 650,000. This impressive structure stands upon just two acres of land yet it is termed as being a true DIY delight. The strategic location of the banks of the Ballyfinboy River adds more value to the residence. The construction of this castle dates back to 1480. However anyone looking into buying this property needs to have adequate amount of time and finances in order to get the castle into shape. 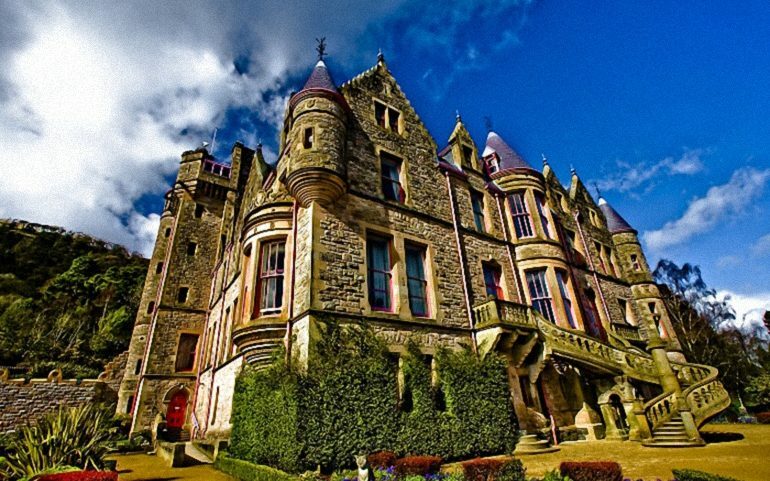 This classic Irish castle is being sold at Euro 200,000.